Features patented field-selectable and changeable direction of rotation-permits installation in otherwise unusable locations. Tri-flange base and mount hole pattern provide easy retrofit when replacing most popular brands. 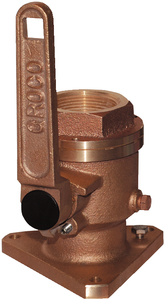 Handle has a square hole that accepts standard ratchet-helps to reach hard-to-reach valves, and eases operation of hard to actuate valves. Stainless steel ball and stem, PTFE seats and seals. Serviceable when installed, drain plug on both sides for efficient winterization.